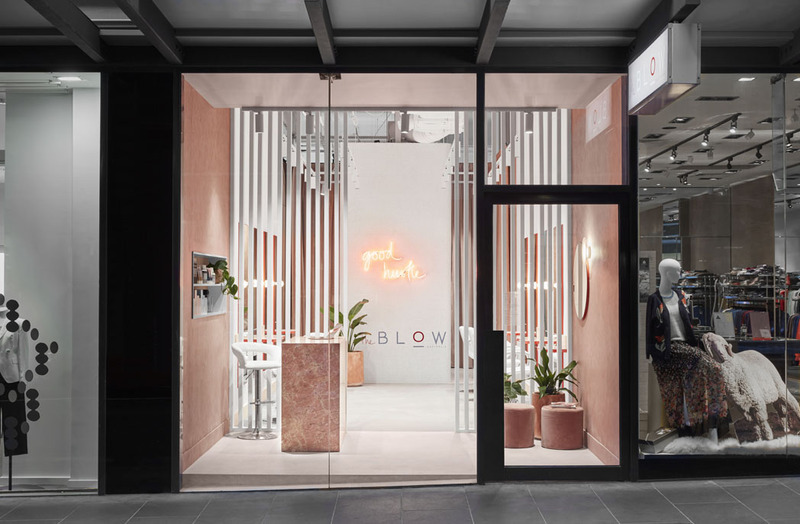 Designed to captivate your attention, The BLOW Australia’s first boutique, located on Little Collins Street in Melbourne’s CBD, is the physical embodiment of The BLOW brand and personality: fresh, fast, feminine, bold, and modern. Designed by Tecture, colour blocked pink and white is punctuated by red accents and moments of humour, combining with screening elements to define the compact floor plan. 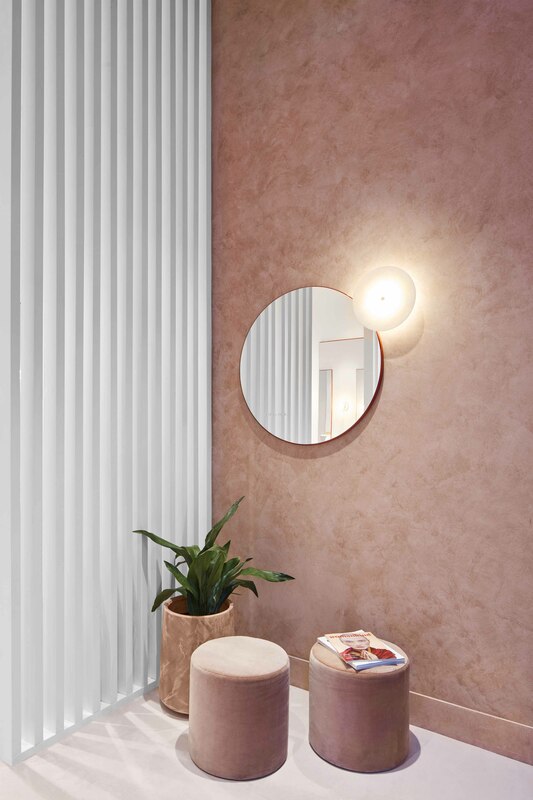 “When we first met with our client and Founder of The BLOW, Phoebe Simmonds, it was evident that the brand’s first boutique needed to make a statement with a clear visual and spatial identity,” says Tecture. 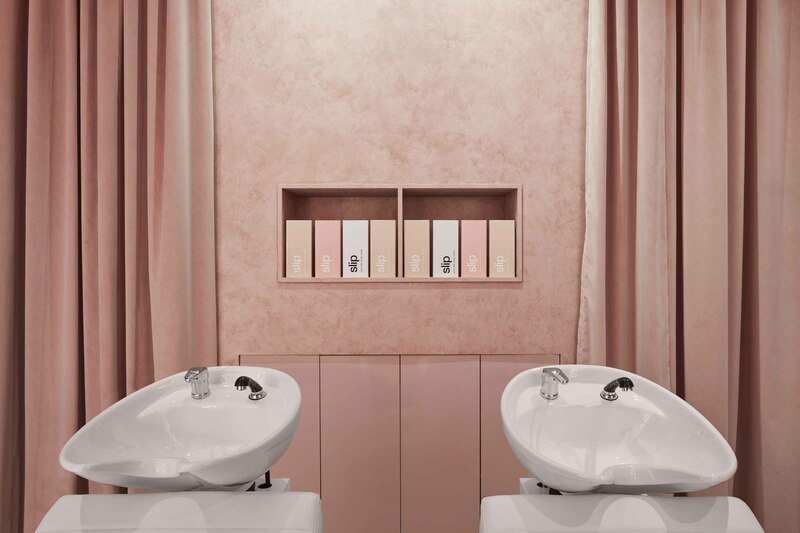 At only 50sqm, clever spatial planning was crucial to allow for ease of flow through the boutique whilst maximising the number of workstations. 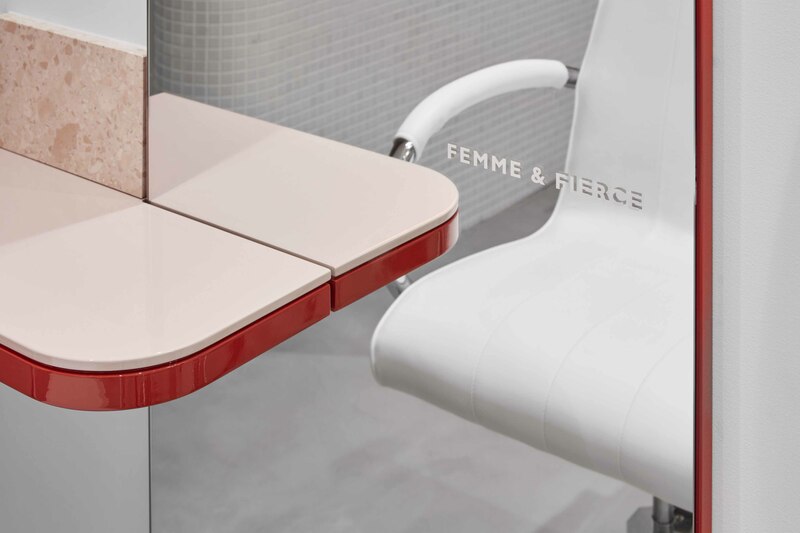 Colour blocking defines the floor plan into three distinct zones – reception, workstations, wash stations – giving the boutique the illusion of greater space. 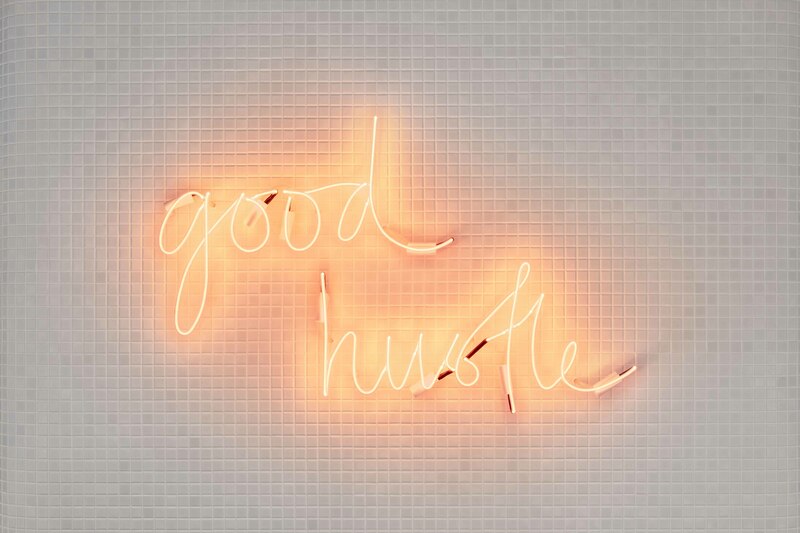 On entry, the signature colour of Ammo Pink envelops you, with pink concrete floors, pink textured walls, pink ceiling, and a monolithic pink marble reception desk signalling that “you have arrived”. Whilst at the back, swathes of flowing pink velvet bring all of the drama to the wash stations. 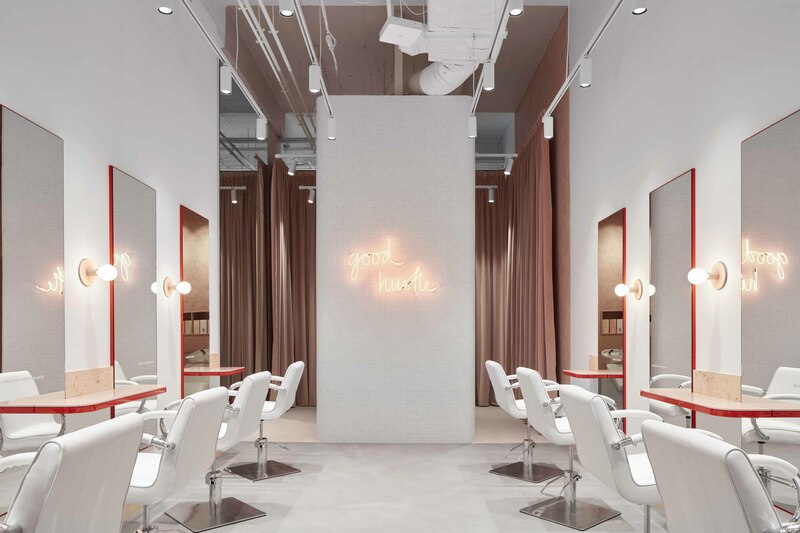 Through the heart of the space individual mirrors accented in frames of Power Red focus the attention on the client, with key slogans such as “get it girl” and “femme and fierce” adding a touch of personality and humour. Vertical slatted screens and a feature mosaic wall with its Power Red neon “good hustle” further zone the space, allowing glimpses through to the magic of the “mane event”, whilst still affording clients privacy. 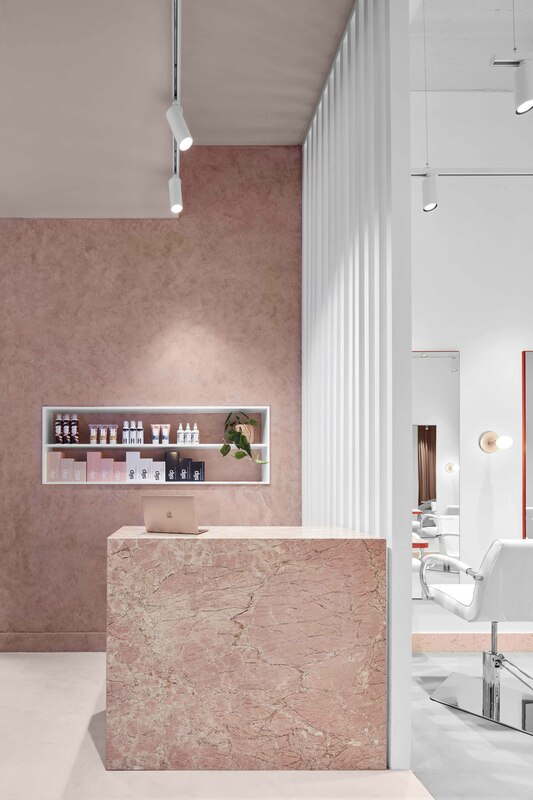 Working with a tight budget and fitout timeline Tecture focussed the design intent and spend on key touchpoints, offsetting high-value items such as the pink marble reception desk with more economic material choices elsewhere. Where cost effective materials were used, the focus turned to unexpected details to elevate these elements – the two-tone 2pac workstation ledges and the curved corners to the white mosaic dividing wall.